If you’re an NFL Game Pass user, you will likely experience blackouts when trying to stream your NFL games. Below, we’ll give you a step-by-step guide on how to bypass NFL Game pass blackouts using VPNs. You’ll need an active NFL Game Pass subscription and a VPN to effectively bypass blackouts and other regional blocks. We’ll also look at a couple of ways to watch some games for free. Below is a quick guide on how to bypass NFL Game Pass blackouts in the US, UK, and Ireland. Sign up for and download a VPN which has server locations outside of the US, UK, and Ireland, and offers lots of bandwidth. ExpressVPN is a great option based on tests we’ve carried out. Install the VPN app on your device of choice. Connect to a VPN server outside of the US, UK, or Ireland. For instance, you can connect to a VPN server in Mexico. Head to the Game Pass website, log in, and proceed to enjoy unrestricted access. Sign up to a VPN service that offers servers in countries outside the US, UK, and Ireland. ExpressVPN is the option we’ve used in our tests and we’ve found that it works well with NFL Game Pass. Connect to a VPN server outside of the UK, US, or Ireland (eg. Mexico). Head to https://gamepass.nfl.com/ and create a new account. Choose and purchase a streaming packaging available in the country whose VPN server you chose to connect to and from there you can start watching games live. 3 MONTHS FREE:Get an additional three months free here when you sign up for ExpressVPN’s annual plan. The deal includes a 30-day no quibbles money-back guarantee so you’ll receive a full refund if unsatisfied. 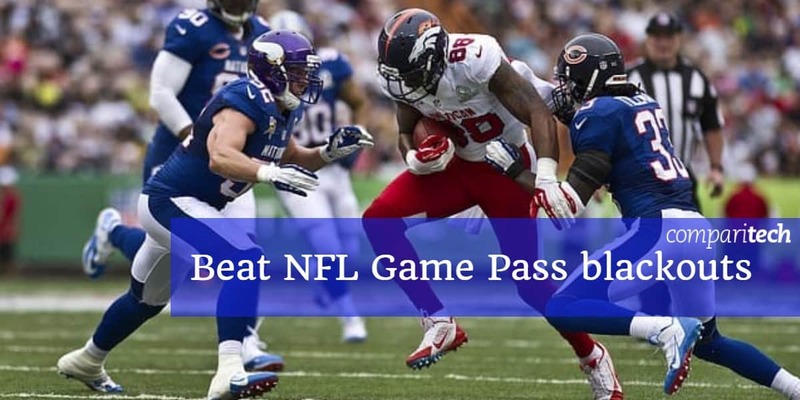 NFL Game Pass is an online streaming service that allows subscribers to stream the entire line-up of NFL season games either live (depending on your location) or on-demand. Whether it’s regular season games, the Pro Bowl, or the 53rd Super Bowl which will be held on Sunday, February 3rd, 2019, you can watch it all using an NFL Game Pass subscription. Due to broadcasting restrictions, if you are located in the US or one of its territories, you won’t be able to watch regular and post-season games live with NFL Game Pass. You will have to rely on replays. Some restrictions also apply for the UK and Ireland. The blackout schedule can be viewed on the homepage of NFL Game Pass. However, if you purchase a Game Pass subscription from any other location worldwide then you will have unrestricted NFL game access, including to live streams of every game. A proven way to access geographically-blocked content on subscription services is to use a VPN. VPNs reroute your internet connection through a secure server in a location of your choice. This lifts geographic restrictions and offers security benefits. Note that the US subscription does not offer live games at all. These are most likely the games you will want to bypass a blackout for. If you have a US subscription and you want to have access to live games then you may want to consider purchasing a new subscription from a country outside of the US, UK, or Ireland. If you do already have a VPN subscription from the UK or Ireland, however, you can connect to a VPN server which is outside of these territories to view restricted games. Is it possible to beat NFL Game Pass blackouts with a free VPN? Free VPNs appear like a good deal on the surface. However, using a free VPN with the NFL Game Pass service isn’t recommended for a few reasons. The most obvious and immediate reason is that free VPNs tend to have limited technology development, and most won’t unblock streaming services like NFL Game Pass. However, there are other reasons you should be wary of using a free VPN. Some services keep logs and even place ads in your browser to make money. In addition, they don’t usually give users a lot of server options. Moreover, free VPNs usually have very low data caps. This is not ideal for streaming video, as you’ll hit that cap pretty quickly, especially if you try to stream in HD. Additionally, many users will likely be competing to use the limited number of servers available which could also hurt streaming speeds. Some free VPN software tools have also been proven to carry malware that infects users’ devices and steal data. Due to all of these reasons, it would be worth your while to check out the paid options instead. There are NFL Game Pass restrictions if you are located in the US, a US territory, the UK, or Ireland. This means that there are some games you won’t be able to access with your Game Pass due to broadcast agreements that limit what you can see if you live in one of these areas. If you connect to a VPN server in any other country where NFL Game Pass is available, you’ll get a different package of options, including the option to livestream games instead of watching all of them on-demand as replays. When connected to a VPN server in Pakistan, for example, you will be directed to the corresponding version of the NFL Game Pass page and will be able to view NFL Game Pass offerings available in that country. The table below outlines what your options are for using a VPN with NFL Game Pass. You’ll be able to log into different Game Pass libraries with one account, but you may need to purchase additional streaming access from the service, especially if you’re trying to bypass blackouts in the US. While you won’t be able to watch all NFL games for free, there are a couple of options for catching some games for free. These options are completely free and don’t require signing up for a trial of a paid service. You will need access to a VPN server which allows you to connect to a US VPN server. This option is only available on mobile devices. Verizon has a deal with the NFL which lets anyone watch in-market NFL games, NFL playoff games, and the Super Bowl for free using the NFL Mobile App by Verizon. Users will need to be in the US or connect to a US VPN server to enjoy this, however. You can watch some NFL Thursday night games for free through Twitch even without having an Amazon Prime subscription (Twitch is owned by Amazon). First, connect to a US VPN server using your VPN software, then head to the Twitch Prime Video page. You will be able to watch national preseason games, live local games, primetime regular season games, the playoffs and Superbowl 53. There were a few games available for the 2018/2019 season but they have all already been played. 3 Is it possible to beat NFL Game Pass blackouts with a free VPN?